On 24 August, the analyst telephone conference for the 2018 interim results of China Power was convened in Hong Kong, which was chaired by the Executive Director and President Tian Jun. In the first half of the year, China Power achieved significant growth in its performance compared with last year, with revenue amounting to RMB10.8 billion, an increase of 18% year-on-year, and net profit attributable to shareholders reaching RMB600 million, an increase of 43% year-on-year. In his conclusion of the company’s performance in the first half of the year, Tian Jun said that notable progress was made in different tasks, evidenced by the followings: first, net profit grew significantly as all segments recorded profits; second, the company made huge progress in clean energy transformation, with the proportion of clean energy installed capacity of the company hitting 40% as of 30 June, an increase of 8 percentage points compared with the corresponding period of the previous year; third, the company obtained outstanding performance in electricity marketing and recorded marked increase in electricity sales by proactively implementing marketing initiatives; fourth, the company exercised effective control over fuel costs, and the rise of unit price of standard coal was lower than the increase of Bohai-Rim Steam-Coal Price Index in the same period; fifth, the management and control of capital expenditure was taking effect. Looking into the second half of the year, Tian Jun emphasized that the company’s focus will be placed on improving performance and promoting high-quality development. To this end, the company needs to pay attention to the followings: first, the company should strive to enhance efficiency and asset profitability; second, the company should promote transformation by bettering allocation of resources in different regions at a faster pace and advancing clean transformation; third, the company should safeguard against risks by gaining effective control over the gearing ratio and maintaining healthy capital structures. The meeting was attended by nearly 100 analysts and investors. At the meeting, the leaders of the company gave detailed replies to investors’ questions, and engaged in in-depth exchanges with investors on electricity and coal price anticipation, reduction of production capacity of coal-fired power, quota of renewable energy, capital expenditure control, and hot topics arising after “531 New Policy” was launched such as photovoltaic development planning, coal price anticipation, prospect of electricity market and deleveraging. 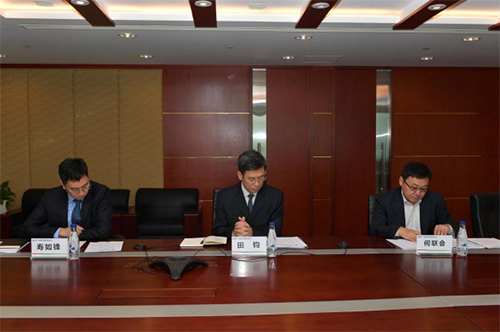 The Chief Financial Officer of China Power He Lianhui and the Vice President Shou Rufeng participated in the analyst telephone conference.